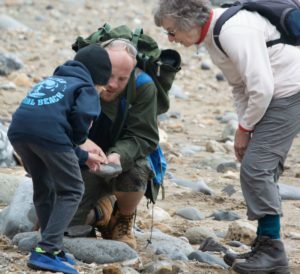 Join one of our guided Fossil Walks with the Wardens to find and take home your own Jurassic fossil! 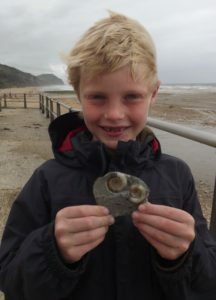 This two hour session starts up at the Centre with a 20 minute talk from the Centre Warden about the fossils of Charmouth and how to find fossils on the beach. The group then heads out onto the beach with the wardens and spend the rest of the session looking for fossils. The Centre has a high ratio of Wardens to members of the public on every walk. During school holidays booking is essential and we advise that you arrive 10 minutes before the walk is scheduled to start to pick up your tickets. Site information: Some uneven ground with sand, pebbles and boulders. Please note some areas of the beach are very muddy. Please be suitably dressed for the elements and wear footwear with good tread. 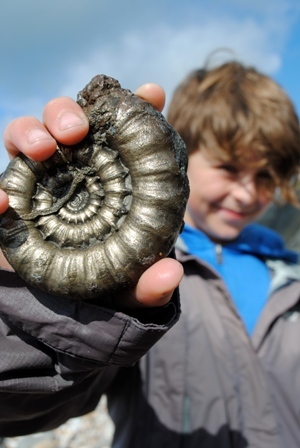 Enjoy a fossil walk with your personal Warden and find your own Jurassic fossils to take home! Perfect for birthdays, families and independent groups. Your 3 hour session starts inside the Centre with an introductory talk by the Warden, where you will get a chance to look at and handle examples of fossils that you might find. You then have the option to either head straight onto the beach to spend the remainder of the session fossil hunting with us, or first take a short tour around the Centre’s exhibits to see our most iconic fossils or watch our fossil film show before heading onto the beach to find your own treasures. We will take you to the best places for finding fossils, and give you tips and tricks on how to hunt for them. These walks are tide dependent and only available outside of the UK school holidays. Our professional Wardens can tailor the walk to all needs and abilities, so please contact us for more details. Advanced booking is essential. Charges: £95 for up to 10 people. Thereafter £10 per additional adult, £8 per additional child (2 years and under go free). Children must be accompanied by a paying adult. We can also cater for larger interest groups too. Please contact us for more details and prices.